Hviezdoslavov is the second fastest growing village in Slovakia. Due to its close proximity to the capital, Bratislava, the population has grown within a very short time period from 400 to over 3000 people. It is, however, only the housing that is growing, and so the village suffers from insufficient infrastructure, missing services and the lack of the public spaces and greenery. 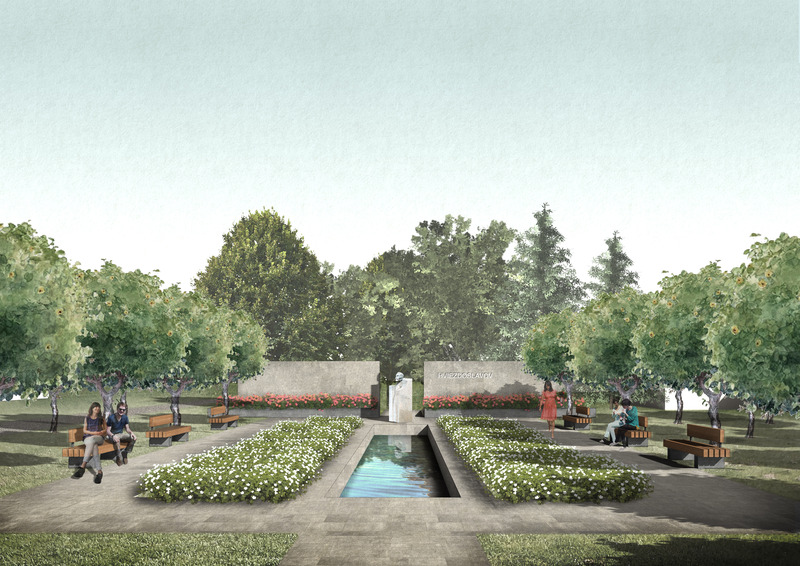 I was appointed to come with an idea of a village centre, which will set a new identity for the village and become a generous public space opened to everyone. 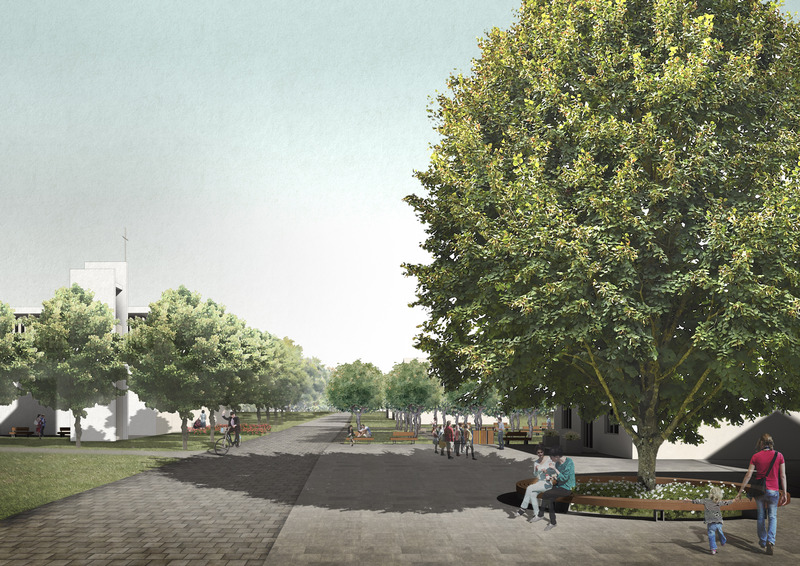 The proposal merges all disconnected open and green spaces around the municipal office into a large urban element: a village park. 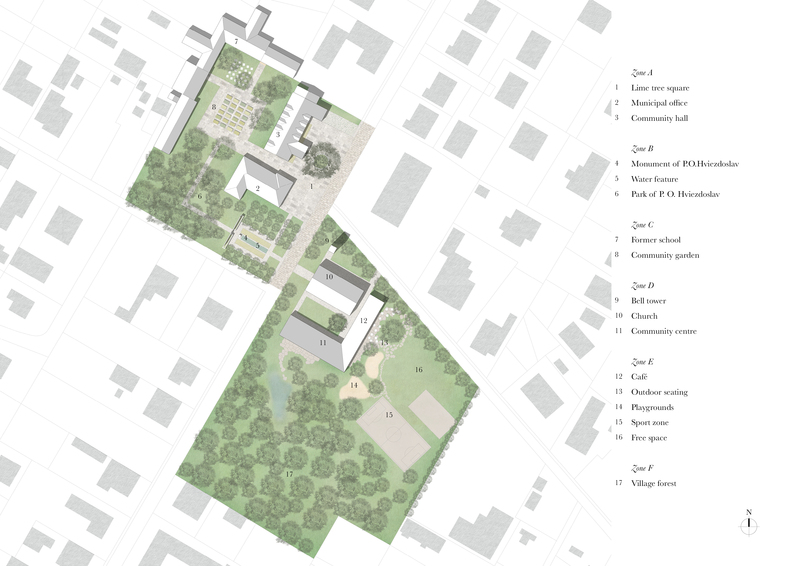 The park is divided into 6 interconnected functional zones, which improve already existing spaces, as well as incorporate the possible future proposals of a new church with the community centre. Together with the buildings, the trees arranged into the grooves, alleyways, or placed as the free-standing solitaires define the individual spaces. The existent road divides nowadays the site of the proposed park into 2 parts. Asphalt in this place is therefore replaced with the paving stones, and the street is incorporated in the overall design. Along its social benefits, park creates public spaces of high ecological quality. Rain water and a high level of greenery improve microclimate and regulate the temperature changes locally. It is believed that the park will catalyse restoration of the natural character of Hviezdoslavov and other rural settlements, which got lost in the process of rapid suburbanisation.